politics by members of the Catholic Church. 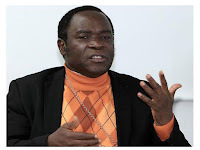 He also called on Catholics who, he said were natural community builders, to vote out bad government Kukah made these remarks in Lagos yesterday, while delivering a speech on, “Family Value, Human Right and the Challenges of Modernization In Nigeria”, at the 38th Supreme Council Convention of the Order of the Knights of Saint Mulumba Nigeria. He noted that the Catholics’ non-participation in politics led to the killing of Christians in the northern part of Nigeria, even as he blamed them for not visiting Christian victims of the dreaded Islamic sect, Boko Haram. “The role of religion in restructuring is much and yet we have not tapped into it. Right from time, Catholic Church has always been helping the government to build and organise the society. The church has always offered direction for the society. If Catholics are in politics as Catholics and not using their ethnicity then they can have the Catholic vote. “Catholic needs to head this country, even the Federal Government does not have the influence the Catholic has and that has not been put to use to change things in the country. The voting power the Catholics have in this country is enough to have the government listen to their complaints, but since we don’t use it, we continue to feel the pain of the thorns of the government policies,” Kukah said.